“Are you crazy?! ?” Immediately followed by “Why?! ?” were usually the first responses I received, after telling people I had toured Chernobyl and Pripyat during my May 2013 trip to the Ukraine. The first question was easy enough to answer: No. However, the second question was one that I struggled to explain. Why would any sane person with even just a rudimentary understanding of the events on 26 April 1986 (the day Chernobyl Nuclear Plant’s Number 4 Reactor suffered a meltdown) want to willingly enter the guarded exclusion zone and stand within 300 meters of the ageing sarcophagus covering the world’s worst nuclear disaster? For me, it was to see, first-hand how the planet can heal itself despite our best efforts to destroy it. I am fascinated with the reclamation process; humankind could quite easily annihilate itself, while the mountains, plants, and even some animals will adapt and adjust and reclaim that which humans sought to destroy. Being at the nuclear facility and walking around the abandoned city also instilled in me a sense of reverence for the loss of human life, the devastation to an environment, and the continued destruction of what should be protected as a World Heritage site (lest we forget) by “stalkers”–fans of the S.T.A.L.K.E.R video games–or poachers/thieves. These are people who infiltrate past guards and checkpoints into the exclusion zone and enter the abandoned city of Pripyat. Some “stage” scenes, such as gas masks on the nursery floor (gas masks were never issued, as no one in Pripyat was ever told that there was an explosion at the core), or move bumper cars around to simulate a left-in-place-during-panicky-evacuation, while other’s paint silhouettes on crumbling walls. So why discuss Chernobyl as Heritage? Chernobyl and the events following the explosion at the number 4 reactor affects all of our lives at the conscious or molecular level, and the accident has a secured a place in history with respect to the dangers of nuclear power. Pripyat–equally important–is fast becoming a playground for those who fail to respect its importance to history and the future. 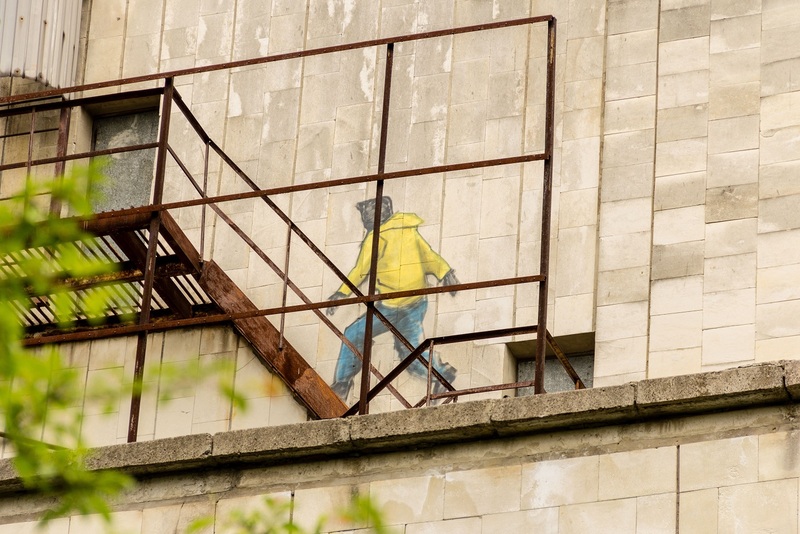 Unless protection is afforded to the remains of this city, Chernobyl Village, and the power plant, we risk losing the physical truths to vandals who deface these remains and attempt to alter the real history. Chernobyl and Pripyat should be viewed with the same awe and reverence we afford great battlefields as a reminder of what can happen when we do not respect that power we create. But, adding spray painted outlines of people on buildings or strategically placing objects for maximum media exposure only detract from the seriousness of the incident.